In what could be the biggest spoiler in the history of American Idol, an Apple glitch occured this week that revealed which contestants are selling the most “Idol” downloads on Itunes. The Producers for AI never wanted anyone to know which contestants are selling the most downloads on iTunes, believing it might spoil the results of the show or favor one contestant over another. They had always requested secrecy of the Idol sales from Itunes. So who is the favorite to win it all according to ITUNES? The NYPost reports Adam Lambert is in the lead, taking six of the top 10 spots on the Idol list. His rendition of “Mad World,” which earned him a standing ovation from Simon Cowell, and is No. 1 spot on the secret chart. The big shock in all of this is the fact that the favorite to win it all Danny Gokey is coming in 3rd with only 1 of his songs being in the top 10. Kris Allen is actually in 2nd place, having 3 of his songs in the top 10. Only time will tell if these Itunes sales will reflect the winner of the show. American Idol: Megan Joy Dishes On Simon, Emilination & More Tattoos! On Reuniting With Son Ryder: “I’m gonna hold him for as long as he’ll let me, and I’m going to try not to sob like a lunatic because I’m sure he’ll just be confused and scared. It’s going to be beautiful. I cannot wait.” She adds that she doesn’t get to go home until “hopefully Wednesday” because she has to “wrap things up here” and finish doing press. The new American Idol rule that gives the “American Idol” judges the power to save one singer voted off by the fans wasn’t enough to keep the first two finalists from getting the boot. Jasmine Murray and Jorge Nunez were sent home Wednesday, reducing the number of contestants to 11. The new rule essentially gives the judges the power to veto or overrule the choice of the voters. For example, the judges can decide not to send home the contestant getting the lowest votes. This is however a one time privilege meaning the judges can only to this once this season. Plus all four judges have to agree to save the contestant. Once saved, the contestant is however on their own for the next week and could end up going home the next week if they are one of the two lowest vote getters. If a contestant is saved, then two contestants are eliminated the next week. Also this veto has to happen before the finalists get down to the final five. This rule might just be what AI needs to shake things up and perhaps help a deserving contestant stay on longer. The French version of the show has had this rule in place, and it has been a success. It makes it less of a popularity contest and more of a talent competition. 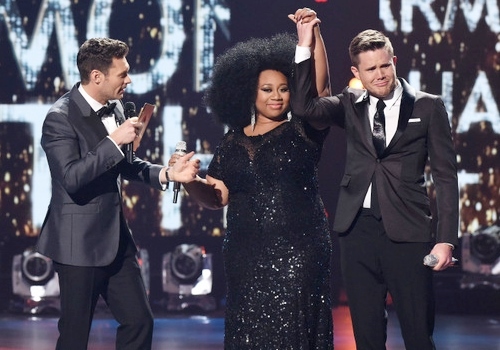 American Idol Final 13 Talk About The Show’s New Twist! Adam Lambert: I think it’s really exciting, because I think both Anoop and Matt are incredibly talented, and I’m glad they’re both part of the crew this year. It was a surprise — we had no idea. Our mouths just dropped open. Lil Rounds: I’m excited! I think we made a little history here tonight. Danny Gokey: I think American Idol did it right. When it got down to [Matt Giraud and Anoop Desai], how the heck do you split those two people up? Matt Giraud: This is a bad bunch, man. Some of these cats are so talented. I’m just honored to be considered. That’s how I feel right now.